While my mind is still full of jellybeans and bunnies, I think it’s about time we got caught up on all the fun we’ve had this last week! So here, in an eggshell, is Puffy’s Easter. . 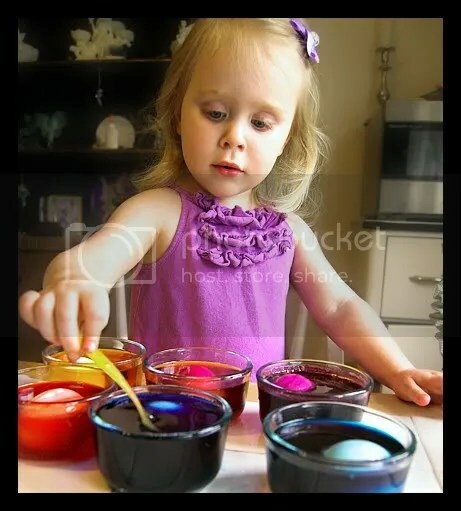 This year, for the first time, T got to dye eggs. Aunt Ki came over to share in our first-time fun, and having that extra pair of kiddo-wrangling hands definitely helped to make the experience more enjoyable for me (less clean up, more pictures) I was a bit worried that the dyeing process might take more patience than T has in her tiny toddler body, but once again T surprised me! 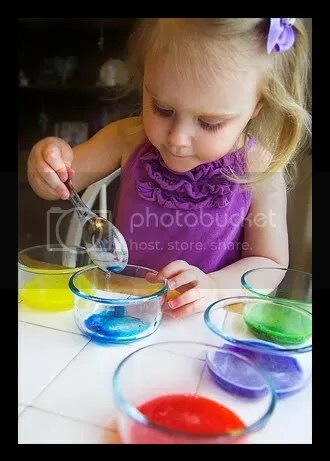 Of course, she DID try to put more than one egg in the cup at a time, constantly – but other than that she did perfectly – from the mixing of the colors, to the finishing touches. . .
We got the Paz egg dye kit to make monsters (I was too tired to do anything cooler than a store-bought kit this year). Although I was given a bit of a hard time for choosing the monster theme over glittering princesses – I know my kid, and she had way more fun with this than she would have the . . . ahhhhm. . . girlier kits. Those weren’t quite as creative! This kit came with an insane assortment of silly monster face stickers and some puffy fluffy monster hair (the hair was my job, tho T chose which color(s) went with each ‘face). T had a great time giving her eggs silly monster faces. . .
. . . and making silly monster faces herself! I think we all had a pretty fun time with this project! Next up in our little Easter parade comes our little Easter ‘party’ day! On Good Friday, I planned a fun-filled day for T and day-baby A. A’s mom went in to work a little bit late that day, and so was able to stay and enjoy a bit of our early morning fun! Me: *pointing* T! There’s an egg! RIGHT next to your foot! T: looks up – into the trees. . .
Me: No, silly – look DOWN. By your foot! Me: Now it’s behind you, silly! T: looks behind her. . . but not at the ground. Me: Look at your feet, hon!!! BEHIND your feet! 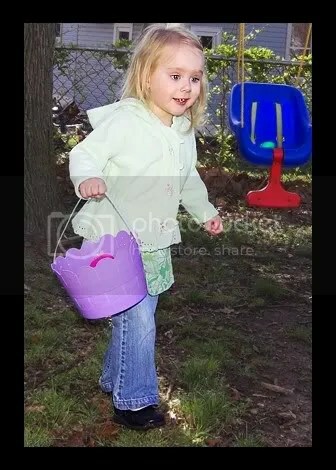 T: I FOUND AN EGG! MOMMY! I FOUND ONE!!! Me: Great job. . . 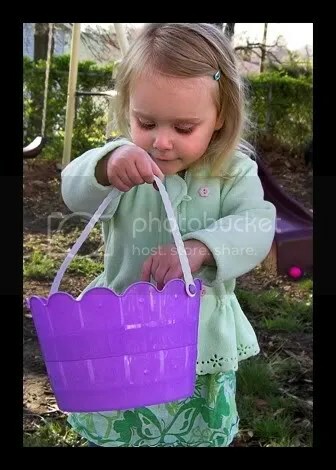 This was A’s first egg-hunt ever, and she was a bit confused about why on earth we wouldn’t let her play with the sandbox/sidewalk chalk/swings, and were instead forcing her to put eggs into a basket. I imagine she was contemplating how incredibly strange and unpredictable grown-up types are. . . but after the first few eggs, she figured out the game, and in the end had almost as many eggs as T did! The eggs were filled with what T likes to call ‘rainbow cereal’ (in this case it was Trix – a rare treat in my house), and Carebear fruit snacks. I didn’t want my little un’s to get TOO sugared up so early in the day! 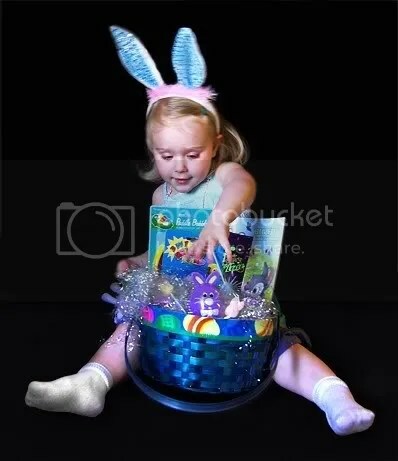 I also made them each a little basket of goodies – mostly toys and girly things; a little bendable bunny, a headband with ears on it, necklaces and rings, Easter-themed hair bows, a little book, a pin-wheel . . . I’m probably forgetting something! But they had their fair (small) share of candy, too. 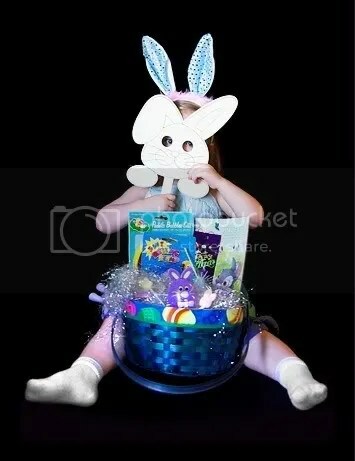 Bunny-head lollipops, and miniature plastic eggs, each one with a single jelly bean nestled away inside. We had super-special Easter-themed party goodies to eat and pizza for lunch – but I don’t have any pictures of that stuff to share! Either way, both girlies had a great time! 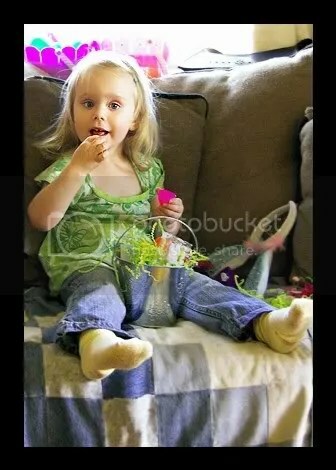 Then, of course, T got her own GIANT basket full of goodies on Easter Sunday. . . I can’t even remember all the fun prizes that were in there, but I know she got a bunny coloring book, some glow sticks, a My Little Pony, bubbles with a flower wand, tinkerbell socks, some Bible story mini books, a stuffed rabbit (of course), a GIANT flower-shaped pin-wheel, a wooden bunny-on-a-stick mask, and candy. . . goodness! I know there was more!!! Of course she loved it! 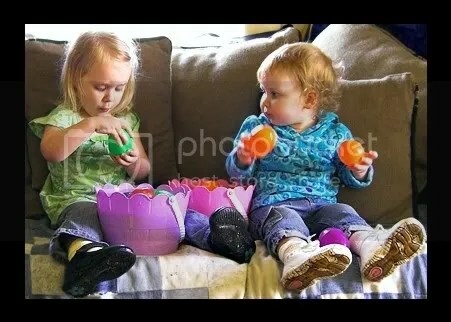 Later in the day we took our monster eggs over to Nonna’s house for yet another egg hunt. . .
. . . and then we had a fabulous dinner. Totally non-traditional – for some reason they decided to make shrimp scampi for Easter dinner, and believe me – NOBODY was complaining (that’s one of my faves even when I’m not pregnant)! Best Easter dinner EVAH! And if all that wasn’t enough, T’s Gammy sent a special Easter card that plays ‘You Are My Sunshine,” a favorite song of the Puffy one. With the money that was enclosed, T got to take a trip to the toy store and she picked out her very first Polly Pocket set and a new whimsy pet to add to her collection (a tiny little tiger)! What fun ! 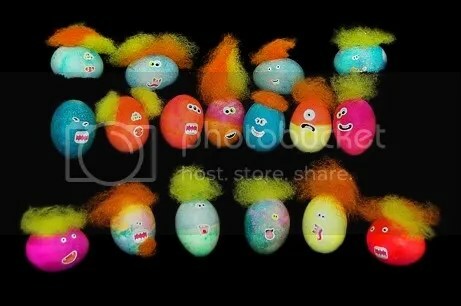 I LOVE the monster eggs. They are way too cute. We only dyed eggs. The colors were pretty fun since Tori wanted to keep putting them in different colors. That pic of T wandering (maybe the second one), she looks SO tall! Aww it looks like T had a great Easter! And A did eventually figure out that these odd things that we kept making her hunt contain goodies and therefore lost interest all over again in the hunt so she could eat goodies. T’s basket looks ginormous! That’s stinking awesome! And just think how fun next years hunt will be with Ro baby crawling around 🙂 Oh and I’m all for non-traditional Holiday meals! Whatever works for you is what works. 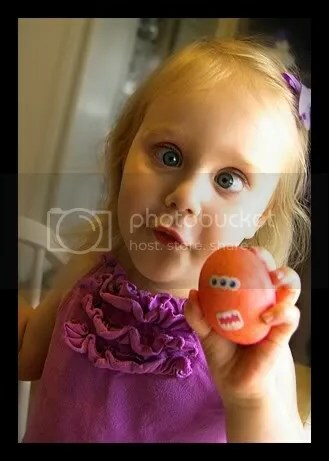 T crossing her eyes with the monster egg is now gonna be my desktop. It replaces the excellent Ro eating T (my fave till today). Jolly good sis, jolly good. 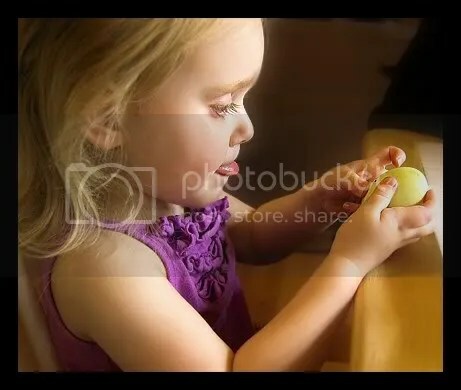 I didn’t even do eggs with my daughter this year. 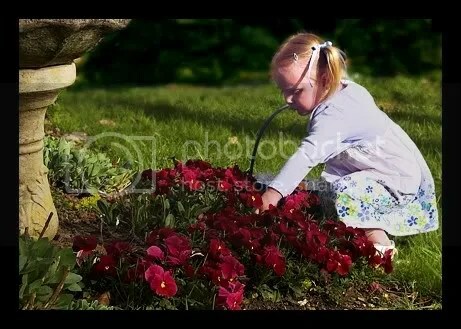 At least she got to do them at gramma’s house! 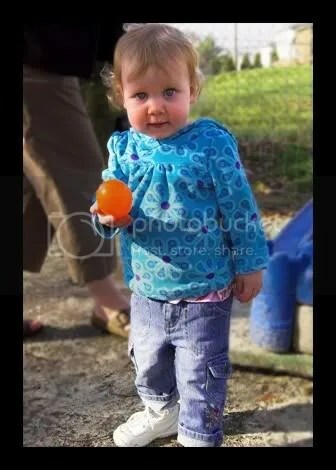 The pic of T walking outside with the swing in the background – oh my word, she looks just like a glamorous celebrity. This pic is exactly like a celeb shot in a magazine. My little guy suffered from the same directional challenges T did, according to my mom, who’d taken him on a Easter egg hunt with his cousins. Hmmm, how is it they understand all that ‘behind you, above you,’ stuff on Blues Clues, but when it comes to an actual exciting holiday they seem to forget everything they once knew. Silly two year olds. We used the same dye kit! Super-dee-duper CUTE!! Both babies T and A are absolutely adorable and it looks like they had a blast being outside, even if there were some directional handicaps to overcome. 😉 I also have to admit that I’m glad you’re still posting about Easter. I’m SO far behind on my posting that I don’t think I’ll ever get caught up, but…I’m gonna try!! You give me hope. You are soooooooo funny! 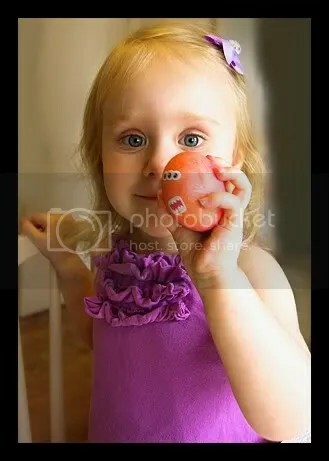 Those eggs are adorable. Fun times are always to in order around your house!